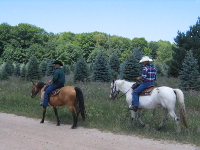 All our trail rides are guided and private. We’ve found that one group at a time is the most fun, so that’s the way we do it. 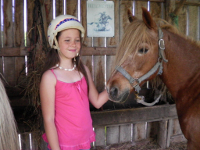 All our rides include walk, trot, and canter through fields and forests, up and down hills. Now if the group doesn’t want to trot or canter, we’d be just as happy walking the whole trail. 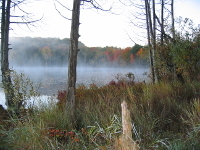 We have hundreds of miles of back-country trail to explore. Full day rides are a great way for a horse and rider to get to know each other. Once that horse-rider bond builds up a little bit, that’s when the real fun kicks in. Ride for a whole day and you’ll understand why they call it Western ‘Pleasure’ Riding. 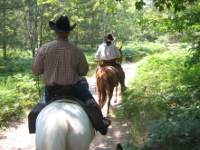 For more information, check out the Horseback Camping page. This is for the mini-cowboys. One of our Wranglers will hand lead a pony around the property for half an hour. A great way to get started with horses when they're still a tad young to go out on the trail. 2 person minimum. A great option for groups that want the old time western experience, but are feeling laid back. Also great for fall time hay rides.